He’s making unfounded claims about the relationship between crime rates and scrutiny of law enforcement. Last week, Attorney General Jeff Sessions said that consent decrees—formal agreements between municipalities and the Department of Justice (DOJ) to improve local policing, often put in place in response to discriminatory practices—can “reduce the morale of police departments.” He wasn’t just paying lip service to police officers; earlier in the month, Sessions ordered a review of all consent decrees across the United States. Under President Obama, the DOJ regularly used these decrees, which offer the department a way to increase federal oversight, to work with cities to overhaul troubled police departments. In Sessions’s DOJ, consent decrees are likely to be rolled back, but his reason—that they make Americans less safe—does not hold up. Worse yet, it incorrectly drums up fears of urban black and brown dwellers as more prone to violence and crime. 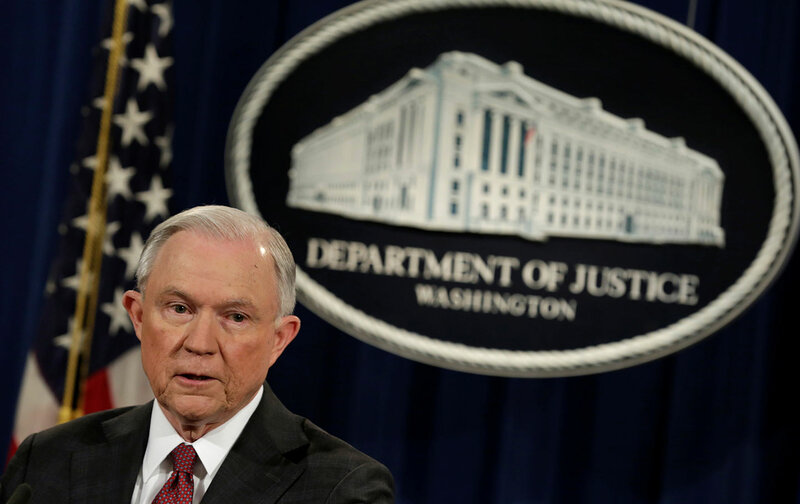 “Every place these decrees, and as you’ve mentioned some of these investigations have gone forward, we’ve seen too often big crime increases,” Sessions continued, speaking to a right-wing talk radio show host. “I mean big crime increases. Murder doubling and things of that nature.” That’s inaccurate. According to the DOJ, there are currently 15 municipalities under consent decree. None of these places has seen “murder doubling.” Homicides did increase dramatically in a couple of cities under consent decree: In 2015, Cleveland experienced its deadliest year in a decade, and Baltimore saw its deadliest year ever (that number improved slightly in 2016). But neither Cleveland or Baltimore had its rate double. In Los Angeles, the homicide rate increased slightly in 2016 to 294 from 283 from the year before, but that number is still drastically lower than the 489 homicides that occurred in 2005. But there were also cities under consent decree where the murder rate declined, including Seattle and Portland. Cities like Newark, which also has a consent decree, saw a historic drop in crime last year. There were zero homicides in East Haven, Connecticut in 2014, another consent-decree city. Meanwhile, in 2015, the murder rate climbed in 100 of the biggest cities in the country, including in cities like Chicago and Nashville, which are not under consent decree. “There is absolutely no evidence that consent decrees lead to increases in crime,” said Richard Berk, a professor of criminology at University of Pennsylvania in an email. The Nation asked the DOJ what evidence Sessions has connecting spikes in crime to cities under consent decree. A spokesperson for the agency declined to comment. This isn’t the first time Sessions has connected scrutinizing law enforcement to an increase in crime. During his confirmation hearings in February, Sessions falsely connected criticisms of police forces to high rates of crime in urban centers. Consent decrees are one way to address problems in police departments, though Professor Berk said there is no definitive proof of their effectiveness. “What you have are some claims of good outcomes and some claims bad outcomes, based on anecdotal evidence,” Berk said. But Sessions has made conclusive statements about the approach, that consent decrees are making America less safe. And that is simply not the case.